Cartelization, as every student of Microeconomics 101 knows, is more likely in oligopolistic industries whose output is homogeneous. What about an industry that has 45 oligopolists who are quibbling among themselves, and is finding it difficult to sell its wares? You would say it’s in trouble. It is, if it happens to be the Nuclear Suppliers Group (NSG), a rich kids’ club formed in 1978 whose sole aim is to deny nuclear technology to nuclear have-nots. As The Economist reported in its 1 November issue, there are a number of issues involving countries as diverse as Brazil, Canada, China, India and Pakistan that are confounding the group. Then there is the issue of trade in enriched uranium. Canada, which has some of the best uranium reserves in the world, does not want to be left behind in the profitable trade in enriched uranium used for nuclear power generation. It, too, wants enrichment technology. The US had urged a global moratorium on the trade and transfer of such technologies in 2004. The Indo-US civilian nuclear cooperation agreement is being blamed as the trigger that is causing the global nuclear restraint regime to fission. This is unfortunate and does violence to the facts. Among nations at the receiving end of technology denial regimes, India is perhaps alone in maintaining an impeccable non-proliferation record. This can’t be said of Pakistan, North Korea or China, for that matter. The latter supplied nuclear weapon designs to Pakistan apart from all manner of help in the area. Its concern (and anger) is at the “strategic imbalance" in South Asia after the nuclear deal. Its duplicity on nuclear non-proliferation is clear after Pakistan said China would help it build two nuclear reactors. 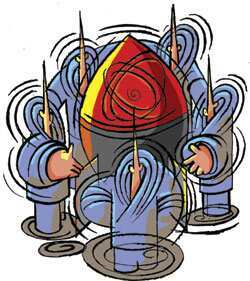 There is merit in denying nuclear technology to countries with dubious intentions. The original members of NSG are in no position to do so: They formed the club well after legitimizing possession of nuclear weapons. Yet that does not mean that it should be a free-for-all with respect to nuclear proliferation. A tighter set of global “good conduct" rules is all that is needed.